What is the difference between a stock pot and a Dutch oven? What do I need to consider when choosing between a Stock pot and a Dutch oven? Can I use a stock pot instead of a Dutch oven? Dutch oven or stock pot for soup? Is a Dutch oven a pot? What makes a Dutch oven different? Can I use a Dutch oven on the stove? What is a good size for a stock pot? 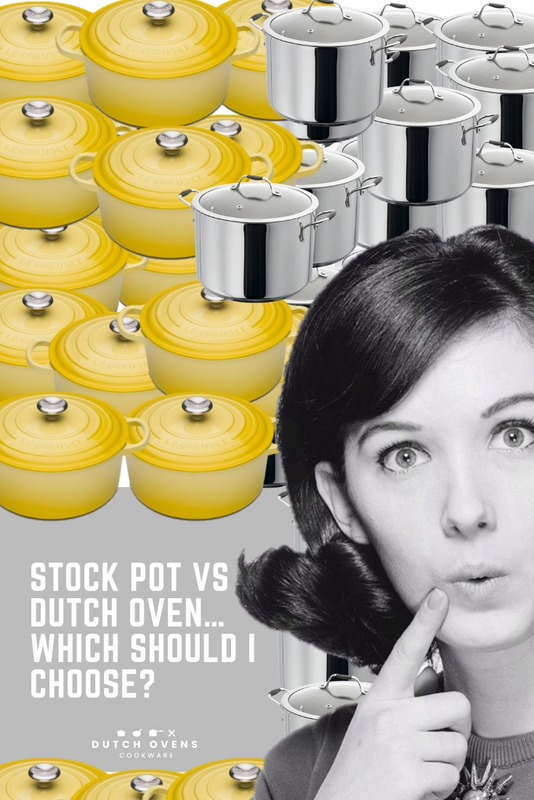 A reader asked me a question about whether a stock pot vs Dutch oven offered the best solution for her needs. In this post, I will answer question and then give you some more detail of what characteristics they offer and what you should think about when deciding between a stock pot and a Dutch oven. I currently have a stock pot that I use quite frequently to make stock, as well as do other tasks in it. I also use it to braise meats, soups, stews and also some Indian dishes. The stock pot has served me well but it is coming to the end of its life, it is in poor condition. I’m looking at a pot that can do most things well with importance placed on stocks and braises. I’m very used to a stock pot with its taller sides but I understand that I could get better results on braises and stews in a Dutch oven. The sides of Dutch ovens aren’t that tall so I’m a little concerned whether it will be suitable for cooking stocks. I am also a little worried about the capacity of Dutch ovens. Can you let me know what whether a stock pot versus Dutch oven offers the best solution given my cooking style and quantity? 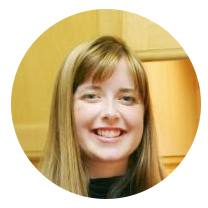 Jayne: Many thanks for your question Amy, it’s an important question you are asking. In my opinion, you can get away with using a Stock pot for many of the tasks you have listed. The difference is that doing things adequately and doing things fantastically well is a world of difference on some of the tasks. Your stock pot will do things like stock better than any Dutch oven…they are designed for that with their tall shape. However, on things like braising meat, Dutch ovens and Braisers will always perform much better by braising more evenly and consistently. On things like soups and stews, Dutch ovens will perform better but the difference is not as great as with other dishes. The ticker cast iron base means that the heat is distributed consistently and more evenly. This means things like soups will not burn in a Dutch oven but may do so in a Stock pot with its thinner base. You say you are concerned that the shorter sides on a Dutch oven will impact your stock cooking. Obviously, stock pots will do a better job than a Dutch oven but I wouldn’t necessarily let that put you off. The taller sides on a stock pot are designed in a way so that liquid does not evaporate like it would on a wider pot. You can remedy this by covering part of the Dutch oven with the lid. This reduces the moisture loss. So, in summary…either is fine but know that if you get a larger Dutch oven, it does give you slightly more versatility. If it is the cost of a Dutch oven that concerns you, you can pick up a Lodge enamel Dutch oven, Tramontina or a Bruntmor one for around $60 for a 6 quart one. This is not prohibitively expensive and the number of things you can use them for make this a fantastic investment. If you are still not convinced by a Dutch oven, go with what you are comfortable using. Stock pots are still a great piece of equipment. Hope this helps. As we all know, stock is the base for soups and sauces…with stock including bones and broth without. Stock pots are specifically designed to make stock. They are relatively thin and made from steel in most cases. The thinness is purposeful as it allows it to heat quickly and allows you to simmer the contents for a long time. They are big but not very heavy. The base tends to be thin too to allow quick heating, especially when you compare to cast iron. Stock pots tend to be big enough to easily cover a whole chicken. They are also used to cook lobsters and other kinds of vegetables such as corn. Aside from cooking, they are also used for other household tasks like dyeing wool and boiling clothing. Their size, which is often measured in liters, makes them very versatile in the kitchen. The original Dutch ovens were simply made from cast iron which was seasoned to make it almost non-stick and prevent it rusting. These days, most kitchens have enameled cast iron Dutch ovens. These need little maintenance and no seasoning. They are almost non-stick but technically they are not. Dutch ovens are incredibly versatile and are used to cook a huge range of recipes. Dutch ovens are heavy…very heavy in most cases. However, this is what makes them so great. They deliver a consistent and even heat which means very few hot spots. This means food cooks well and evenly which delivers better results. Dutch ovens come in a variety of sizes…from 1 quart to 15 quarts. 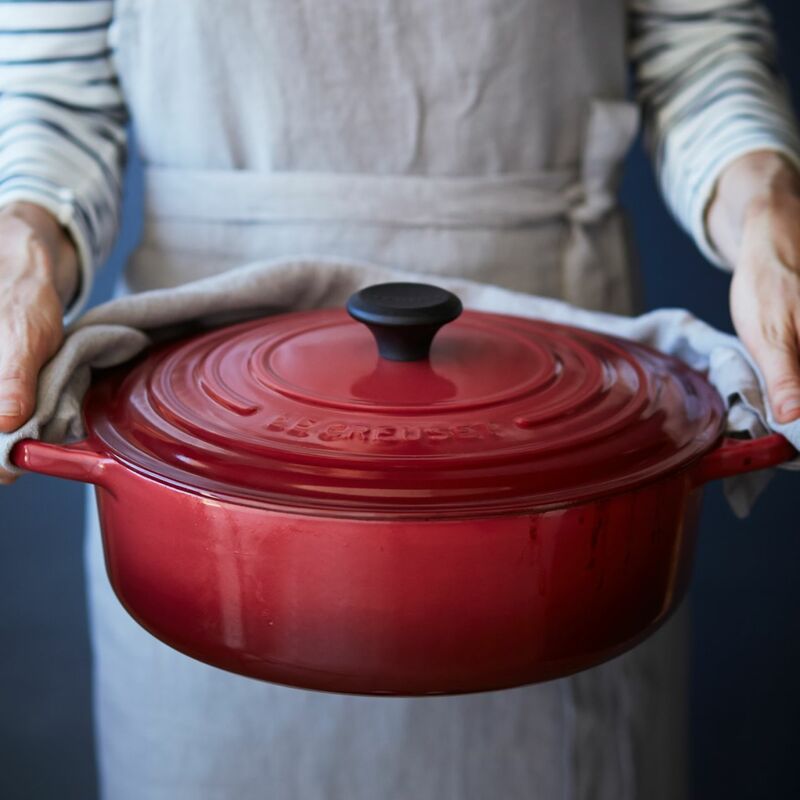 They come in a range of prices to so for example, a 6-quart Tramontina Dutch oven can cast you $70 but a similar sized Le Creuset can cost $300. The difference is in the quality of the material and finishing…as well as brand. However, essentially, they all do the same thing. I use my Dutch oven a lot but two main things I do are roasting chicken and baking no knead bread. For those two things alone, they are worth their weight in gold. There are several areas where they are different. Firstly, the material they are made from. The Stock pots are generally made from steel. This means that they tend to be thinner and lighter. The base tends to be thin too which means that they heat up quickly. Cast iron is the opposite. It is made thicker and it is heavy. The thickness means that they retain heat incredibly well so you can cook at lower temperatures. However, you need to be more patient with Dutch ovens as you have to heat them slowly. Another difference is the level of care and maintenance required. When comparing the two, enameled cast iron is more prone to damage as essentially the enamel is a glass. You therefore have to be very careful when heating it to prevent thermal shock and you also have to take care to use the appropriate instruments when stirring inside. Steel on the other hand is easy to maintain although cleaning may be an issue since they are not non-stick. Dutch ovens are not non-stick either but they are as good as. They are also much easier to clean by hand. A major difference is also the size. Stock pots tend to be larger generally so for large amounts of food, they can be very good. 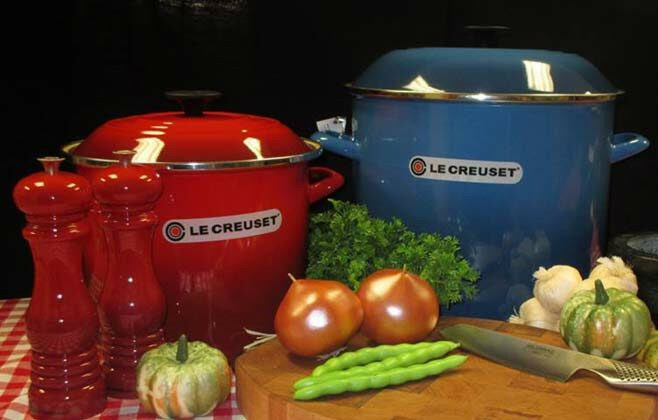 Dutch ovens come in a range of sizes with the most popular being approximately 6 quarts in size. The shape is different too. Whereas Stock pots are tall, Dutch ovens are short. Dutch ovens are designed with tight fitting lids to retain moisture within the dish. The re-circulating of the moisture is part of the cooking process. The design of the Stock pot is tall and this means there is a lower surface area thus less evaporation. In terms of cooking, Dutch ovens deliver an even and consistent heat. Therefore, they are great for soups and meat dishes. Anything that needs slow consistent heat for slow cooking is better done in a Dutch oven. Stock pots are designed for higher liquid content foods which is better to speed things up. Most people, whether they care to admit it, cook foods that they are very familiar with. They therefore have a certain style and pattern that repeats itself. Have a think about what you cook on a weekly and monthly basis? I suspect that many of the dishes are similar and repeated over that period. Once you understand what you cook, you can then decide which of the two is better suited to your needs…and which will deliver better cooking results. The size is important from two aspects. Firstly, the quantity of the food is relevant. If you are cooking large amounts of stock, then a stock pot is better suited to handling a larger volume of liquids. It is also safer to use a stock pot as well just based purely on the design. If you have a wider range of uses, a Dutch oven might actually be more suitable. The second part of this question is your height. Stock pots are narrow and tall. When you consider this on top of a stove top, you may not be tall enough to see what is happening inside the Stock pot. 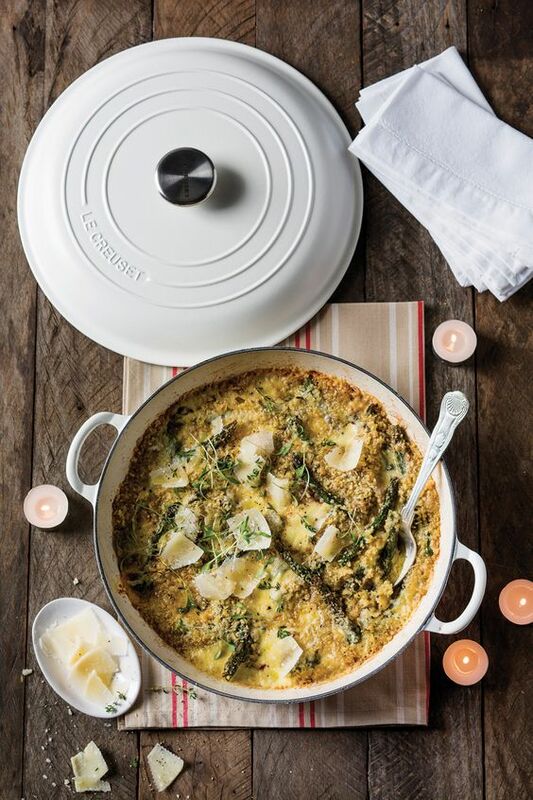 In this case, a flatter vessel like a Dutch oven may improve your cooking experience. This is an important consideration, especially as we get older. Dutch ovens can be very heavy…in some cases up to 20 pounds. Obviously, they are cast iron so there is not much you can do to reduce the weight. Can you handle that kind of weight being moved around the kitchen? Also, bare in mind that this is the empty weight, add the food and liquids into the equation and you have something very heavy and very hot!. Safety is paramount so consider this aspect carefully. Stock pots are a lot lighter and easier to maneuver as they are narrower. This may be the better solution if cooking volume liquids is your thing. Generally, stock pots are cheaper to buy than Dutch ovens…in most cases. Obviously, things will change depending on the quality and brand. Enamel Dutch ovens need very little maintenance these days but you do have to wash them a certain way and ensure they are fully dried before you put them away. Failure to do that may result in rusting. In comparison, steel stock pots are easier to care for with no special requirements. If this question was the other way around, then the answer would be a clear yes. However, it is very difficult to replicate the quality of results that you get from a Dutch oven. They are pretty unique in what they can deliver. Stock pots are tall and narrow which means that they do not cook as evenly. The thinness of the base means that you can easily burn the contents and you get plenty of heat spots too. Dutch oven deliver even heat which means that you do not burn easily and you can cook at lower temperatures. The ‘flatness’ of dutch ovens means that food is cooked more evenly too and the moisture is circulated within the vessel. The consistency of soup means that they are better cooked in a Dutch oven. Stock pots are designed for liquids but soup has a thicker consistency. This means there is a danger of it cooking unevenly in a stock pot and possibly burning at the base due to the thickness of the base. In a Dutch oven, the soup will cook more evenly with very few hot spots. The end result will be a better cooked soup with no burning and more depth of flavor. In the Stock pot vs Dutch oven debate, it really does come down to the factors I discussed above. The best thing you can do is to analyze the type of foods that you cook regularly and then weigh up the considerations such as weight, size etc. Essentially, the choice is a personal choice. Having said that, I am a huge fan of Dutch ovens and I know the potential they have to cook delicious foods. I would always recommend one in every kitchen regardless. In the Stock pot versus Dutch oven conundrum…well that will come down to what you prefer and what you cook. Let me know what you think…what did you decide to buy and why? Did you have any regrets or any success stories you want to share….leave a comment below. It would be really nice if you could share this image on social media…it’s just a couple of clicks for you but it means the world to me. Yes, it is a pot as it is a vessel with a lid. Sometimes they are refereed to as dutch pots…however, that is rare. The cast iron is what makes them different. The properties of cast iron mean that they retain the heat so you can cook at a lower temperature. It heats evenly and creates few hot spots which means a better result in your food. The tight-fitting lids help retain the moisture within it which is recycled back into the food. The end result is perfectly tender meats and thick tasty sauces. Yes, you can use them on most stoves whether they are ceramic, induction and gas etc. Read my article on this topic here. They are very versatile so have confidence. The golden rule with any enameled cast iron is that the maximum heat should be medium, heat them slowly and don’t ever heat them while empty. A good size for a stock pot is normally around 6 quarts. This is plenty of room for most sauces, stock and broth. Owning a slightly larger pot also gives you that flexibility to do more things in larger quantities. In terms of Dutch oven sizes, read the following article.